Unfortunately, many people in America still believe that addiction is a moral problem or behavioral issue. Across the nation, people with substance use disorders are still viewed as choosing to drink or use. Despite overwhelming evidence that addiction is a brain disease and chronic illness, those in recovery from addiction are demonized not only in the media but on a personal level. This stigma can create overwhelming shame and guilt which prevents millions from receiving the treatment they need to recover. Family members of people who use also may struggle with their own shame and guilt falsely believe that their loved one “just won’t quit.” The stigma of addiction has far-reaching consequences. People who experience stigma are less likely to seek treatment. This can result in a variety of economic, social, and medical costs. According to the National Institute on Drug Abuse, substance use disorders costs our nation over $600 billion annually. Treatment can significantly reduce these costs. Perceived stigma in hospitals or doctors’ offices can readily discourage those affected from accessing needed healthcare services. Studies have found that some healthcare providers feel uncomfortable working with people who are dependent on drugs thereby limiting their ability to provide the unbiased, needed assistance. When health providers carry a stigma towards people with substance use disorders, it can affect their willingness to assess or treat the patient with the appropriate resources. It can also impact how they approach the person in need of help, and it may prevent addicted individuals from seeking treatment altogether. 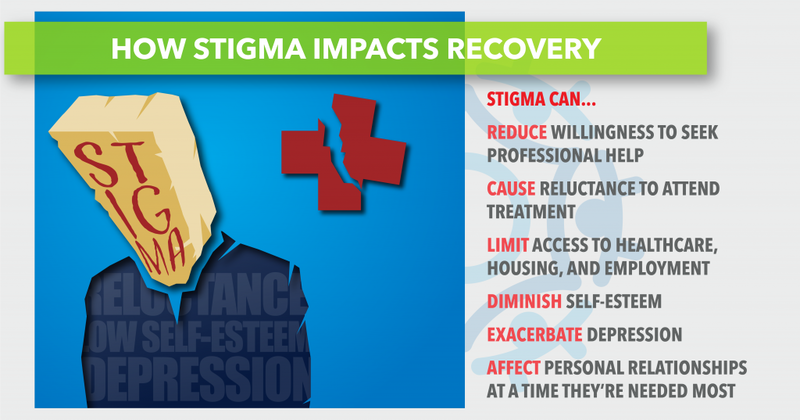 Perceived stigma can impact all areas of a person’s life. The chronic stress of discrimination may affect the mental, social, spiritual and emotional health of individuals who use drugs. People with addiction regularly lose touch with their community and family, resulting in profound loneliness and isolation that contributes to the exacerbation of symptoms that surround addiction. When a person does not have social interaction, they are less likely to reach out for healthcare or treatment. Similarly, they may not experience the needed social pressure that can impact an individual’s decision to seek treatment. Having a loved one with addiction does not mean accepting that they have the illness and taking no action. Studies consistently show that people can and do recover as a result of an intervention. Open, supportive discussions with people who have an addiction can create accountability and move a person toward treatment. No matter the situation, no one likes to feel judged or devalued. 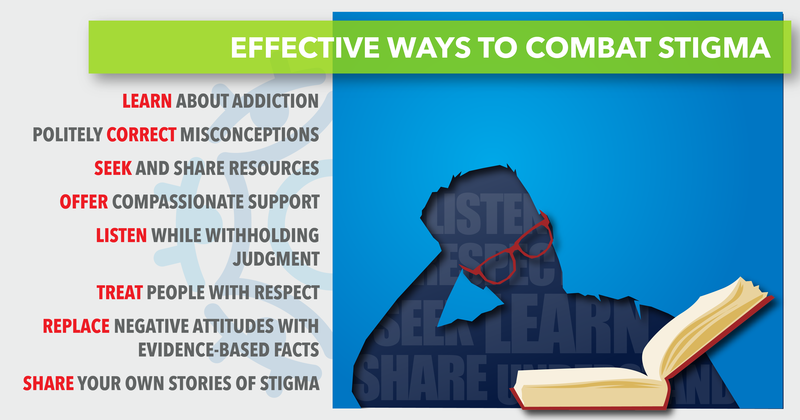 In order to encourage people to reach out for help and get on the path to recovery, it is important to reduce the stigma surrounding addiction. Recovery is possible. By remaining open and continuing to share your own personal stories with addiction, others can be given the gift of freedom. Do not remain anonymous. People can and do recover.